The Rogue name is shrouded in a decent amount of mystery, having no official website or any accessible information about the manufacturing company, location, or… basically anything else. 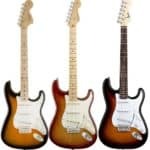 But after speaking with some Guitar Center employees and performing some dedicated Google searching, it became clear that Rogue guitars are the house brand for Musiciansfriend—an online musical instrument retailer. In 1999, Guitar Center purchased Musiciansfriend, meaning Rogue is linked to both Musiciansfriend and Guitar Center’s brands. Rogue has been making music equipment for at least a decade and produces budget gear including guitars, basses, ukuleles, banjos, effect pedals, amps, mandolins, and more. One particularly beginner-oriented aspect of Rogue’s business plan is their pushing of discounted Value Packs. The Value Packs include an instrument, a case/gig bag, a book and/or DVD explaining the basics of how to play the instrument, and sometimes some other gear such as a strap or picks. The most expensive Rogue product hits just about $300, and the highest priced Value Pack reaches just around $370. Rogue seems to be an all-around beginner brand with no high-end options for intermediate or professional players. Basically, the only people who should purchase a Rogue instrument are total beginners. While they make tons of different instruments, this review will be on a particular electric guitar by Rogue, called the Rocketeer Deluxe. 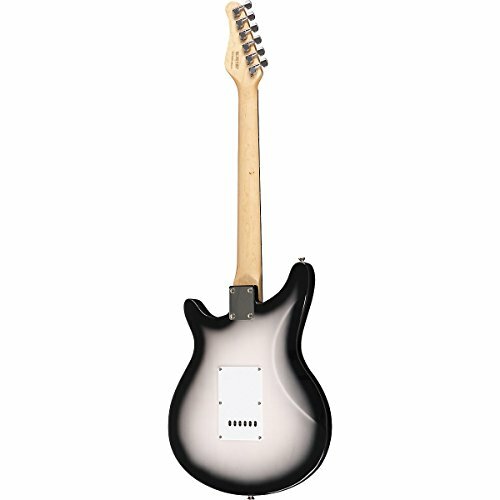 Body: The Rocketeer body looks like some kind of hybrid of a Stratocaster and a Rickenbacker, with a broad tail end and narrow curvature leading up to the short, rounded horns. The body is made of basswood, which is a decent tonewood—yielding good midrange response and sustain—but it is a bit lightweight and soft, making it susceptible to denting pretty easily. The upper-backside and front-right of the guitar have slanted cuts, making it an extremely comfortable axe to play. The Rocketeer comes in two sunburst finishes, vintage and gray, of which the vintage looks a bit nicer and more professional. Neck: The neck is made of maple and is bolted on, topped with a rosewood fingerboard with dot inlays. The fact that the neck is a bolt-on may take away some potential warmth from the guitar and instead lend itself to somewhat of a twangy response. But the maple/rosewood combination adds some warmth to the guitar’s overall tone and boosts the low end, which keeps the tone more balanced than it otherwise may have been. The neck has 22 frets, the higher of which are easily accessible thanks to the huge cutaway. The neck curvature is ultra-thin, meaning it’s pretty fast and lends itself to quick soloing and smooth playing. 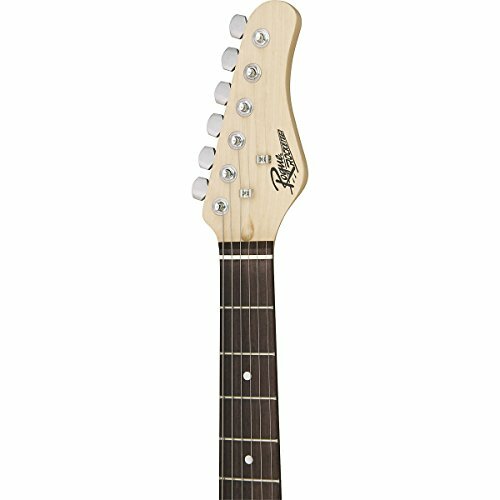 The headstock resembles a Stratocaster headstock with smoothed, rounded edges, which appears aesthetically consistent with the curvature style of the body. Pickups: The Rogue Rocketeer has an H-S-S arrangement of no-name pickups, with an open-faced bridge position humbucker. What’s a bit surprising about it—given that it’s a budget instrument—is that the humbucker has coil-splitting capability, which is activated by the push/pull tone knob (similar to the Yamaha PAC112V). The single coils are a bit buzzy and overly bright, but the humbucker is pretty good and surprisingly hot. Using just the humbucker or the humbucker-middle single coil combination relieves the buzz pretty effectively as well. With the 5-way pickup selector switch, tone control, and coil-splitting, there is a wide variety of tone options at your disposal, although across the board the tone lacks some harmonic complexity and overtone response, sounding just a bit dull. But for a budget guitar, the pickups are sufficient. Hardware: The Rocketeer hardware looks nice and is of decent quality. The white tortoise shell pickguard adds a vintage aesthetic to the guitar and definitely makes it look more expensive than it actually is. The volume and tone knobs distinctly resemble Fender top hat knobs in white, and the pots they control feel smooth to the touch. The 5-way pickup selector switch feels strong enough, as long as you’re not thrashing it around, and the ¼” jack feels reliable, although it does get loose every once in a while. The tuners could be better and do detune somewhat, but they’re not terrible and are fine for a beginner. The bridge has a through-body tremolo bar with adjustable bridge saddles, which is a nice addition for a budget instrument. The tremolo arm does feel a bit cheap though, so being gentle with it will be a necessity. Overall, the Rogue Rocketeer sounds good for the price, coming in at a super affordable $130 (check this listing for the latest live prices). 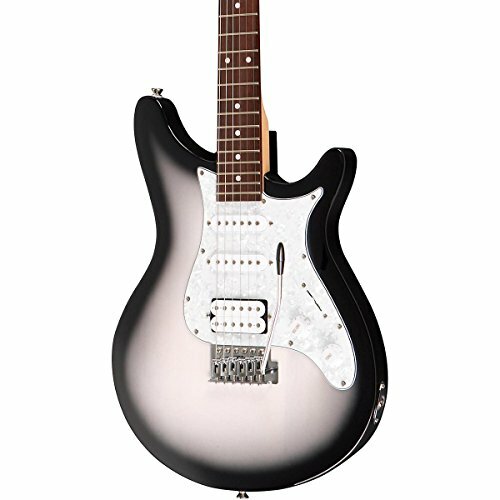 For a beginner, the guitar provides exactly what you want: versatility, tone control, and an easy-to-play neck. The sound is a bit thin, as is expected of budget pickups, but does have nice dynamic response, largely thanks to the humbucker with coil-splitting capability. The bridge position humbucker is hotter than the two single coil pickups and adds some mid and low range power where the single coils are lacking. One area where the Rocketeer excels is in its versatility. The guitar sounds best with some distortion or overdrive—because the fuzz adds some overtones that are lacking from the clean tone—but the clean channel has a decent amount of character on its own as well, especially when the humbucker is being used. Overall, I give this guitar a 3.9 out of 5. 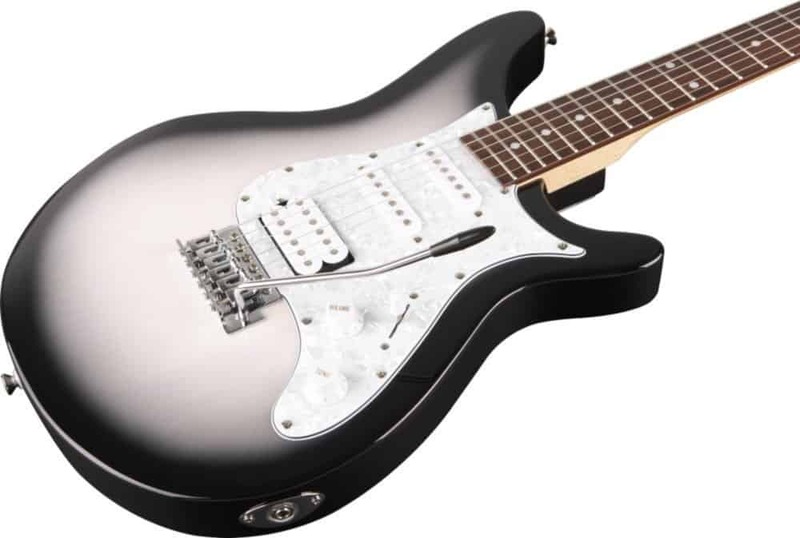 Despite the helpful addition of a coil-splitting humbucker in bridge position, the low quality of the pickups means that I can’t fully back the Rogue Rocketeer and recommend it with a super high rating. It is, however, a great instrument for a beginner and especially for the mega cheap price of just $130 (check this listing for the latest live prices). 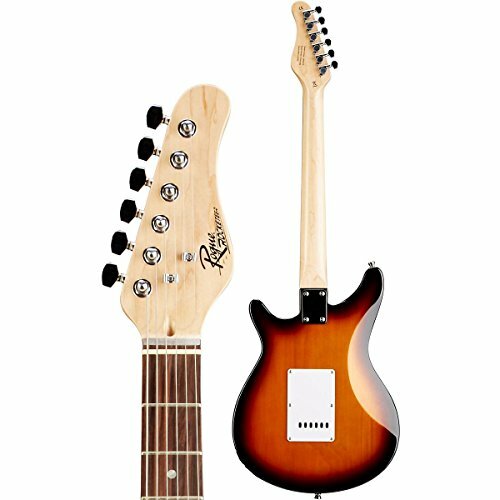 The hardware is mostly fine, with the exception of the pickups and the tremolo bar, although if you were going to be serious about modding this guitar out, you would definitely want to replace the tuners and the tremolo system as well… at which point you may as well just buy a new guitar! The versatility of the Rocketeer is really its greatest appeal, sounding presentable across a variety of genres from jazz to rock, funk to metal, and so on. The pickups respond best with some overdrive or distortion, but the clean tone production is not bad and is passable for a beginner. This is perfect for new guitar players who haven’t yet decided what genres they would really like to pursue and can be used for a beginner to explore genres until one sticks out. Then the next guitar you buy can more specialized for your interests. With this guitar, the name of the game is beginner. The Rocketeer is great for someone who is brand spanking new at playing guitar. 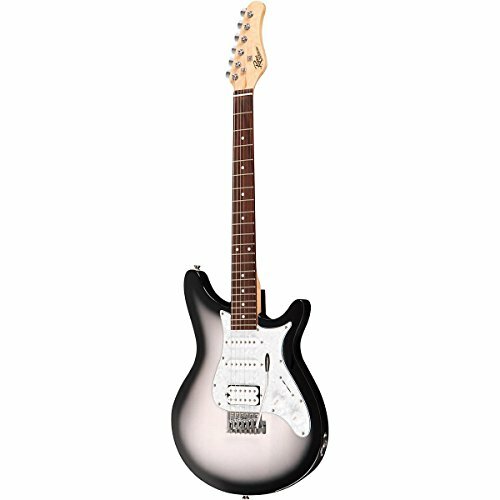 But for someone who is still somewhat new at guitar but is looking for a slight upgrade from their first instrument, this is not the guitar for you. 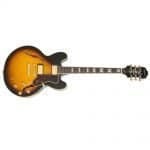 Opt for something a little bit more pricey, in the $200-300 range even, and you will be more satisfied with the reliability and quality of the guitar. For more options or alternative guitars to try, check out my round-up of the Top 11 Electric Guitars for Beginners! This is a good assessment of this guitar, but it should be noted that it is almost on a perennial sale for as low as $60. At that price, this little guitar is an absolute steal. I purchased mine not because I am a beginner, but because I paid $70 and originally I was going to part it to build a cigarbox guitar. Now the thought makes me cringe as it is a very playable little instrument with a pretty decent tone and the neck plays really nicely. I should point out that I am handy at setting up guitars and I adjusted the truss rod a bit and tonality myself. In doing that I discovered one big flaw of this guitar: the bridge adjustment runs out before one can intonate some of the strings. In other words, the distance between the nut and the bridge is too short for half the strings. Next time I change the strings I will cut the tension spring behind the individual bridges, which should allow me to pull them back another few millimeters and give me enough room to adjust the tonality correctly. At the moment, even with a very low action, all the strings are a bit sharp at the 12th fret with the adjustment set all the way back. 3 of the strings are only a few cents sharp, but the other 3 are almost a quarter tone off. Another job all these guitars need badly is to file the frets edges. They are sharp to the point I was afraid to cut myself. I used a small file to take care of it and now the neck is buttery and comfortable. Personally, I don’t find the neck and middle lipstick pickups as thin as many claim, or as buzzy. I have read a review on Amazon from someone that claimed it was the cable they packed with the guitar that caused the buzz for him. I find that credible, because even in my old house (with no ground to speak of) the buzz is minimal and at the same level as my Ibanez Pat Metheny, which has a humbucker at the neck. Yes, they could be better, but at $70 I can easily boost the sound with my phone app and spend the other $930.00 on another guitar and buy another rocketeer just for the hell of it. I only wish they made Telecasters at the same price (I got one of those stolen as well). To me the important thing is that it feels and sound just like my old Strat. The second position is full on “Sultans of Swing” and for the price I can’t complain. Beside beginners, I think this would make a great guitar for Jam Sessions in crowded bars. When I played in those and brought with me my Strat or my George Benson Ibanez, I had to go around with the guitar case strapped to my ankle for fear of it being stolen. To a thief, this guitar looks good enough to seem more expensive, but if stolen the economical damage would be lessened. Yes, you can often find this guitar on sale (thanks for mentioning), also I agree, it is a great one to take out to “jam sessions in crowded bars” — perfect.